N.B. this post is based on RWYB days at Santa Pod. To then register your car/van and you to use the track, all day, is an extra £25. To be a passenger on a run in your car/van, passenger registers and pay's an extra £10, to ride in any car/van willing to take them down the track, all day. Not sure who would take a passenger, as it slows your times down. But some people do. OK, so this map is good but one aspect is very misleading. The road between the ticket booth and the right hand corner next to the first shop is a LONG way. Always confuses newbies if they have studied the map. Pay you £10 per person at the ticket booth, drive the (surprisingly long) way along the Blue line to the Blue square. Return to your van, get into the queue. Red line is the queue, where you wait side by side with others. N.B. the person you are next too may not be who you end up running with. Purple line is the "Fire up lane" where you will be put into one of several lanes by the stewards. From this point onwards, pay close attention to the stewards. You will pull forward till you come to a stop line. Wait till you are directed to come forward by the stewards, who will ask you to hold up your arm, so they can see your drivers band, which was given to you when you signed on. Watch who else the steward beckons forward, which side of you they are on will let you know which lane you are running in. A full valid recognised driving licence is required to sign-on. Seat belt is mandatory for your own safety. Helmets required for all bikes and open top cars, and any vehicles doing 110 mph or more at the finish line. Arm straps required in open top cars. Bikers have to wear crash helmet together with appropriate motorcycle riding apparel. One-piece or two-piece zip-together suits are recommended, made from suitable materials. You may be suspended from using the strip if you are not appropriately dressed. T-shirts and shorts are not safe items to wear on the track. EVEN IN A VAN! Before you go on to the track you need to visit the signing on office to sign a declaration form and pay your signing on fee. Any nitro or methanol cars must give us at least 3 days notice if they wish to run at a Rwyb. On a side note... make sure your vans are in a decent state to drive generally. Stewards have every right to refuse you dragging if your motor is in a poor state. The BIGGEST no-no that you will NOT be allowed on the track for is leaks. Oil, water.... anything dripping from your van and you will not run. If you do and they have to prep the track again, you will be VERY unpopular with both the stewards who will have to spend time fixing the track and also every other racer who will have to wait while they fix the track. If you are looking for help on "How do drag", feel free to PM me. Although I am NOT an expert by any stretch of the imagination! Also, have a look at these links. I have been talking to the guys on the Santapod RWYB Facebook page and been getting very positive feed back from them. There are very supportive and are looking forward to seeing us all race next year. Feel free to sign up and ask any questions you like, they seem like a really nice bunch. Letting you see your times not only on a print out when you are there but also online when you get home. All you have to do is write the number on the back of your van when running. Stickers with your number look cool and can be bought pretty cheap on eBay but shoe whitener is also recommended which will be available from the signing on office. If you do NOT sign up for a free CC number, you will be given a free non CC number on the day, which a steward will write on the back of your van with a shoe whitener. You will get all your times on paper that day with this number on it but have no other record of it. I am NOT an expert. But I have run a few cars and my van around 20-25 times now. 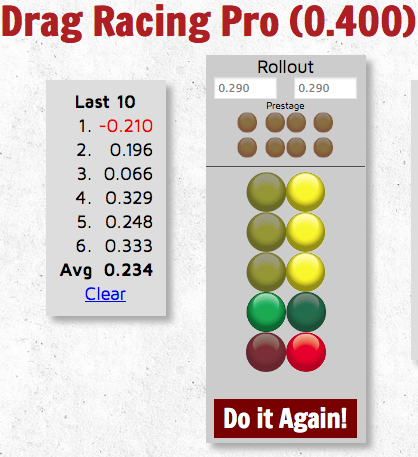 Here is what I have learnt from my time on the drag. Don't Panic. Lots of people to chat to and ask questions. So talk to them/us. Inspect your van before getting in the queue (Before leaving home!). Look for leaks as you will not be able to run with leaks. If you do, the track will need to be prepped again, which takes 20-30 mins and stops everyone else racing, you will be very unpopular! Wash your van! Make sure it is nice and clean. You WILL get faster times, plus the photo's will look better. Make sure you engine is warm. (Tick over in the queue will do the job) You wouldn't drive fast with a cold engine on the road, so why do it on the track? In racing, weight is EVERYTHING. (Says the man with a very heavy fully converted camper van) So only have in your van what you really need. i.e. as little as possible. You do NOT need to burn out your tyres if you don't want too. Avoid the water bath if you don't fancy it. Dry cold tyres are better than wet cold tyres. Your reaction time (at first) does NOT matter. Concentrate on getting a nice, clean start. Rather than worrying if you move as soon as the lights change. Go when YOU are ready and the lights have changed, not panicking to go as soon as they do. Totally ignore the car/van/bike you are running along side. They have NO impact on how you drive, so why worry how they are doing? Keep your foot down till you are OVER the line. People tend to back off before the line. Kills your time. Obviously. N.B. If you miss the hole in the wall DO NOT STOP OR REVERSE, keep driving and turn left at the next turn. If you do get the bug, the next thing you will want to do is get better. So I highly recommend setting up a video camera inside your van if you can. If you want the video to look cool, point it down the strip, so you can watch it again and again. I will be setting one up for the first time this year. That way you can see when you change gears, how smooth the changes were and WHERE on the track you change. All things to use to help you improve, if you want too. There is also an app you can download to help you see your times and work out what is going on. The app is free but membership to the data is charged. It is $1 for a day or $24 for the year. Not used it myself yet but I might do next year. Worried about the Christmas tree? Have a few practices here and see how you do. Pretty sure it will be the "Pro Tree" so make sure you choose that on the website when you are practising. Here is my attempt... the red shows I went too soon and defaulted. The whole point of this is for it to be a FUN day. Everyone to have a laugh and enjoy themselves. Never a "My co*k is bigger than your co*k" scenario. We treat each other with respect, the stewards and race officials with respect and our vans with respect... we will be a great day out! Blackett Photography are usually on site taking loads of snaps of your runs. They are nice and the owner runs a T4, so he MUST be a nice guy.